I have been reading a lot about canning and jams and jellies and all of that. I have a few mason jars but that is where my supplies end. I need to purchase a deep pot and all of the other items for removal and such. I’m really excited to give it a try when I get around to it. We ran out of jelly for Baby McDorkin the other day. He is a total peanut butter and jelly addict. He squeals in pleasure when I grab the jar of peanut butter and then he tries to open the refrigerator to get to the jelly inside. Since I was out, I decided that maybe I can use his new love for clementines to my advantage and make my first ever attempt at a marmalade, rather than making a store run for just jelly. I was actually surprised at how easy this is!! I only made a very small amount- 3 clementines worth. You only need a couple things to make it, 2 are from the citrus fruit itself, the zest and the inside wedges. I don’t have a zester, so I used a peeler and then scrapped any access pith off. 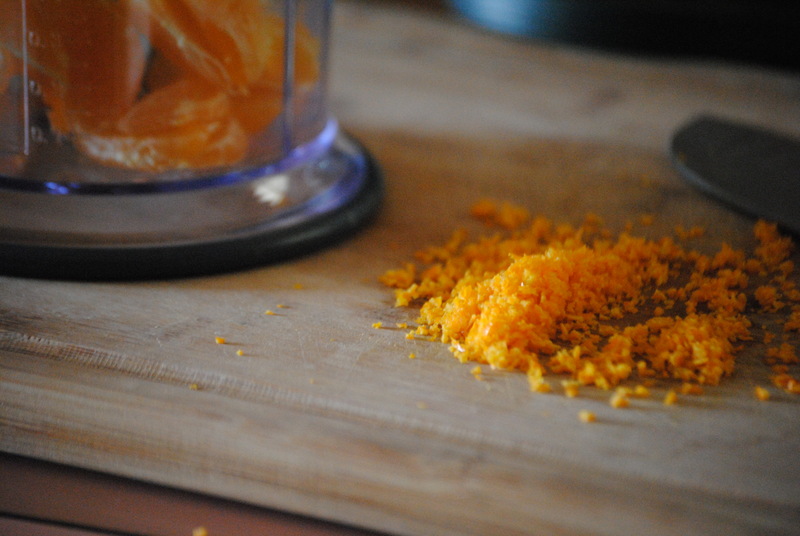 Then I tossed my zest in a pile, grabbed a knife and started chopping and chopping until it was pretty fine. Then I put the wedges in my processor, giving it a few whirls. Put those both in a sauce pan with a 1/2 lemon’s worth of juice(more if you are making a larger batch) and then sugar to taste. I got up and stirred it every 5 or 10 minutes as it simmered at a low heat with no lid. When it was done, I just used a recycled jelly jar, let it cool and then put it right in the fridge. It made my house smell so good I want to make this every day just for the amazing scent!! This entry was posted in Food and tagged canning, clementine, easy, jelly, mandarin orange, marmalade, simple, treat, yummy by themcdorkins. Bookmark the permalink.